An investigation is underway after a dozen Myanmar workers in a minivan started vomiting and passing out. 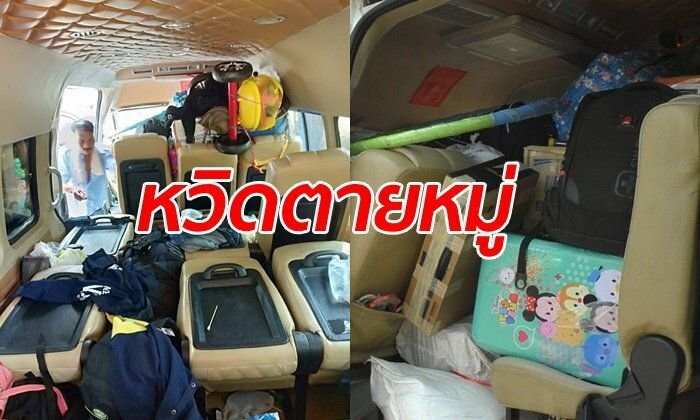 When rescue workers arrived at the scene on the Asia Highway in Chainat they found 11 people unconscious. A two year old baby was screaming. They were all revived except an old lady who was taken to hospital but she survived too. Driver Prakhiang, 54, and his wife sitting next to him said they were both fine. He said he had been hired to take the workers from Surat top Mae Sot for the Songkran holidays. He said there was nothing wrong with his Toyota Commuter van and it was not likely to be a problem with the CNG gas system. His wife said that as they traveled along people started passing out. Soon they were all unconscious except the baby. Prakhiang surmised it might have been something they ate - they had eaten at four gas station on the way. Another theory is that all the possessions of the passengers blocked the air-con vents causing them to lack oxygen. Wonder who came up with that brilliant theory? If the minivan was being driven like they normally are then the passengers probably passed out from sheer terror. With the horrible air I am surprised this is not happening more in Chiang Mai. Maybe someone let out a deadly one? Maybe the same cop who told me that the reason my wife and I slept through a burglary was because the thief probably sprayed sleeping gas in the outside compressor of our ac unit. Actually introducing gas via the a/c unit was a very common practice in some of the African countries in which I lived. Also used in Latin America - sophisticated and very effective. To read this brings back memories of S.Africa and Nigeria. Actually that is a thing. Back in Hanoi some years ago, the more organized thieves started injecting some sort of gas into the air con tube which sends you into a deeper sleep. You wake up feeling a bit groggy and realise that your phone is not where you thought it was and so starts your worst day. The second thing that happens is that your wife wakes up and accuses you of taking her phone, and so it goes . . . . . I get those symptoms every day after a been bar.